I believe that karate with Sensei Tim has helped improve my self-confidence. I used to have trouble speaking in uncomfortable situations. However, I am now a very outgoing person. Karate with Sensei Tim has helped me feel more confident and I've learned how to defend myself in a precarious situation. Karate has also helped me learn self-discipline. 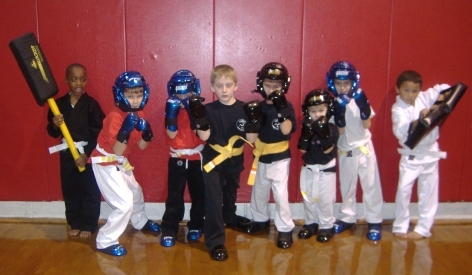 A few years ago we heard about the karate class and thought it would be great for Luke. Little did I know that it would turn into a family affair and awesome friendships. Luke was 4 years old when he started and he will be 8 in September. Over the past several years he has learned far more than I ever thought was possible. He is passionate and disciplined to learn. In watching Luke, little brother Connor started practicing karate on the sidelines at the age of 2. Soon after, he jumped in and hasn't missed a beat. We are working on the discipline part of Connor and he is overflowing with passion, especially in sparring. We've had to teach him a little self control. Connor will be 5 in November so he has been participating for about 2 1/2 years. Then, not long after Connor started, daddy jumped in the older class, and he greatly enjoys it. It is so awesome to see all 3 of them involved together in an activity that they all love so much. Without Tim, Gina, and Morgan pouring their heart and soul into this program this would have never been available to us. We have enjoyed our lasting friendship that has been made with the Garriss Family. We most of all want to thank them for their dedication and service to all these children and adults. Their lives have impacted ours and many, many others in ways they will never know. May God bless them for all they do. My son started Goju-Shorin Karate 6 years ago with Tim Garriss as his Sensei. I have always been fascinated and a fan of martial arts and with the pugilistic arts in general. My personal life at that time was very strained and my self confidence was at an all time low. After about a year of watching my son and after receiving encouragment from Tim and a female student who was about my age, I decided to give it a try. I am so glad I did! Karate has helped me through many dark days and has given me a feeling of joy and accomplishment that nothing else has ever given me. I have made life long friends and shared in their accomplishments as well. I have seen my son turn from a little boy to a young man who I am very proud of. About 2 years ago, I got my step-son involved and I have seen the positive effects that Karate and the Garriss family have had on him as well. I have also had the privilege of getting to watch Morgan grow not only from a little girl into a beautiful young lady, but have seen her go all the way to Brown Belt. Amazing!! I can't say enough good things about Tim, Gina, and Morgan Garriss and the Garriss Martial Arts Program. My son, Bart, started karate a little over a year ago. When he first began, he could not stand still and he asked questions just to hear himself talk. Outside of school, Bart is a bundle of undirected energy. Karate with Sensei Tim has been such a wonderful thing for him. It has given him a way to focus some of his pent-up energy into something positive. Now he can stand at attention for a good while without fidgeting, and he can remain quiet when it's necessary. He has a goal he is working toward now: his yellow belt. My husband and I are so grateful for all the time and patience Tim and his family give to their students! This is what Bart had to say about his karate experience: "I love karate because it's fun and you get lots of exercise. It's awesome because you get your white belt and when you get up to your black belt, you can be a teacher like Mr. Tim."